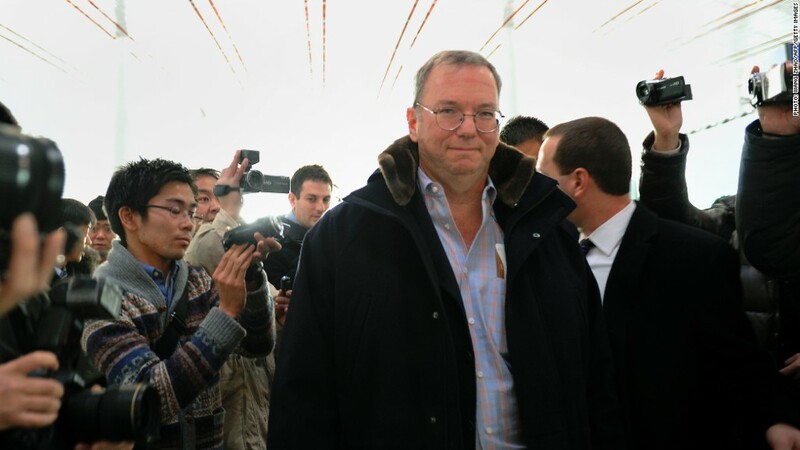 Google Chairman Eric Schmidt was spotted Monday at Beijing International Airport. A controversial private trip to North Korea by Google Chairman Eric Schmidt and former New Mexico Gov. Bill Richardson got underway Monday, according to media reports. Despite intense media interest over the past week, few details of the trip -- which is taking place despite objections from the U.S. State Department -- were known. But broadcasters in South Korea reported the delegation flew from Beijing to North Korea on Monday, and photographers spotted Schmidt and Richardson at Beijing International Airport. Sources told CNN last week that the trip is a "private humanitarian visit." It is thought that Richardson's objective will be to try and negotiate the release of an American prisoner who was captured last month in North Korea. A brief statement released by Richardson over the weekend confirmed the pair would be joined by adviser Tony Namkung and Jared Cohen, a former State Department official who now works at Google. The statement also said the group will hold a news conference in Beijing on Thursday, presumably to mark the trip's conclusion. Asked last week about the trip, a representative of the State Department said the trip was ill-timed. "Frankly we don't think the timing of this is particularly helpful, but they are private citizens and they are making their own decisions," State Department spokeswoman Victoria Nuland told reporters. "They are well aware of our views." Richardson has visited North Korea numerous times since 1994. Former presidents Bill Clinton and Jimmy Carter have also traveled to Pyongyang in the past three years, successfully freeing American prisoners in both instances. New North Korean leader Kim Jong Un has expressed a desire to increase the country's technological and industrial standing in the world. Google (GOOG) has been expanding its presence throughout Asia in recent years but it has run into problems in China due to censorship concerns. It is unclear if Schmidt will meet Kim during his visit. In a statement issued last week, a spokeswoman for Google said the company does not comment on "personal travel." -- CNN's Wolf Blitzer and CNNMoney's Adrian Covert contributed to this report.